[17:15] -NickServ- This nickname is registered. Please choose a different nickname, or identify via /msg NickServ identify <password>. [17:15] -NickServ- You have 30 seconds to identify to your nickname before it is changed. [17:15] -NickServ- You are now identified for DataBot. [17:15] -MemoServ- You have 2 new memos. [17:29] <Darkwell> anyone been doing any own chassis to the raspberry ? [17:33] <dagerik> okay got arch running. how do i proceed to play videos. [17:35] <Darkwell> any pics ? [17:37] <Darkwell> ok those cases seems "big"
[17:38] <Schnuws> maxinux: who claims? [17:40] <Schnuws> Isnt the wood kind of "scratch" sensitive? [17:41] <Schnuws> you can 3d print in wood?! O.O! [17:41] <IT_Sean> 3D printable wood? [17:42] <IT_Sean> Have you been licking toads? [17:46] <Schnuws> carving and magic? [17:47] <Darkwell> calibrating a lathe ? [17:49] <Schnuws> is it hard to build a cnc machine? [17:50] <Schnuws> a computer who builds something for me? [17:53] <Schnuws> a laser cutter? [17:57] <Schnuws> do airplane use propellers these days? [17:57] <IT_Sean> did you really just ask that? [18:00] <SpeedEvil> Darkwell: shaft jet? [18:00] <IT_Sean> ... good luck with that. [18:01] <dagerik> why am i unable to install firefox on arch. [18:10] <IT_Sean> What has that got to do with anything? [18:13] <IT_Sean> Is this on HDMI, or composite, dagerik? [18:14] <IT_Sean> your video / overscan settings... Have you checked them. [18:14] <IT_Sean> Could be an issue there. [18:14] <IT_Sean> No idea where they are in lxde, though. Sorry. [18:15] <IT_Sean> What was that? I'm just curious. [18:15] <Darkwell> darkPassenger, is it base64 there to ? [18:16] <Darkwell> darkPassenger, tries otrlib ? [18:16] <SpeedEvil> what's the point of using bit torrent? [18:17] <Triffid_Hunter> yah, how many boxes is that dir synced between? [18:18] <Redostrike> so you can add torrent files anywhere and they start downloading? [18:18] <Redostrike> or download them to dropbox? [18:19] <Darkwell> darkPassenger, what client(s9 DO YOU USE THEN ? [18:20] <IT_Sean> hey, darkPassenger, i've been meaning to ask you... is your username a Dexter reference? [18:21] <Redostrike> sure darkPassenger thats ok but dropbox is integrated with so many other software packages so why botter? [18:21] <Darkwell> what about rsync and rdiff ? [18:21] <darkPassenger> Redostrike: you can't really use dropbox on the pi..
[18:23] <darkPassenger> Redostrike: are you talking about python-ing your way in with the API ? [18:27] <gildean> doesn't rsync only copy changed/new files by default anyways? [18:27] <darkPassenger> compressing sound really good..
[18:48] <Darkwell> darkPassenger why not jsut register a free dyndns service ? [18:56] <Darkwell> have you tried vnc anytime ? [18:56] <Encrypt> darkPassenger, Which kind of traffic? [18:57] <darkPassenger> Encrypt: all kind minus immoral stuff ? [18:58] <dagerik> i issued startx through ssh -X. but only the lxde background shows. where is the other stuff like the bottom task bar. [18:58] <Bushmills> openvpn isn't difficult to set up and works rather well. [19:02] <alpha1125> Anyone know of a sensor that will sense water flow? I'm looking to to add it to rip w/some solenoids. I want to detect a leak / burst solenoid. [19:02] <alpha1125> or what would be an appropriate flow sensor. [19:02] <Darkwell> alpha1125, what is your requirements ? [19:03] <alpha1125> Darkwell, micro irrigation system I'm building. so the flow when on is 25L/min max. [19:04] <IT_Sean> They do make water flow sensors for commercial applications. [19:04] <IT_Sean> There must be one to fit your needs. BUt it'll probably be expensive. [19:07] <Darkwell> and a solenoid to uild a "speedometer"
[19:08] <gordonDrogon> alpha1125, adafruit have some water flow sensors. [19:09] <gordonDrogon> they have cheaper plastic ones too. [19:09] <ShorTie> micro irrigation ?? [19:12] <Amadiro> dagerik, by typing "mplayer"
[19:13] <Amadiro> dagerik, what did you try to type? [19:14] <Amadiro> dagerik, well, why do you want to start an lxterminal? [19:14] <ruhju> why you're trying to use mplayer instead of omxplayer? [19:16] <Amadiro> dagerik, but just for completeness sake: if you want a graphical terminal to appear locally through ssh, you need to use "ssh -X", if you want it to appear on the raspberry pis X-session, "DISPLAY=:0 lxterm"
[19:17] <dagerik> can i use pacman to install omxplayer? [19:17] <wroberts1> anybody try beaglebone black yet? [19:18] <Amadiro> dagerik, try "pacman -sS omx"
[19:19] <Amadiro> dagerik, then I guess you do not have it in your repositories. [19:48] <fredmorcos> does anyone know where the source of this issue could be? so that i can ask/look accordingly? [19:51] <ruhju> xset s off? [19:52] <Redostrike> you ssh to it with other pc? [19:53] <eric_j> can someone point me to the source code of the video driver? [19:53] <Redostrike> dagerik why not install vncserver? [19:54] <Redostrike> then why do you have lxde? [19:55] <Encrypt> dagerik, Did you enable Xorg forwarding ? [19:57] <Encrypt> dagerik, By the way, why do you want to stream videos through SSH ? [20:06] <gordonDrogon> camera and display. [20:07] <gordonDrogon> connect a TV/Monitor and keyboard to it. [20:07] <Darkwell> gordonDrogon, which is which ? [20:08] <IT_Sean> Darkwell: those are the DSI / CSI connectors. For the Foundation provided Display and Camera modules. [20:10] <Darkwell> wrong protocol ? [20:10] <IT_Sean> You'll have to wait for The Foundation to release their display module. [20:10] <IT_Sean> Basically, yeah, wrong protocol. [20:10] <Darkwell> is it controlled from the video chip ? [20:11] <IT_Sean> Untill we get closer to the release date, it's pretty much an unknown. [20:11] <IT_Sean> Darkwell: don't hold your breath. The GPU is very much closed source and hush hush. [20:12] <Darkwell> you mean an nda ? [20:13] <Redostrike> dagerik do you have speaker connected to your pi? [20:13] <ruhju> dagerik, from hdmi? [20:19] <dagerik> ruhju: yeah i got sound. [20:20] <IT_Sean> HDMI, or analog? [20:20] <IT_Sean> The analog audio comesouta is not very good. [20:21] <dagerik> wow. the people have low pitched monster sounds. as if the video was sped down. [20:24] <alpha1125> gordonDrogon, thanks for the tip on adafruit. [20:25] <Darkwell> linuxstb , has that documentation resulted in any libraries to ? [20:48] <Nimatek> I just tried Arch on the Pi, there are no haskell packages in the repo. Does anyone know the reason why? [20:54] <dagerik> the sound is too low pitched it seems. [20:56] <Ricksl> Don't you hate it when life takes up all your free time. [20:57] <JakeSays> and i was able to get the internal isight camera that i lifted from my macbook to work on my pi. that was fun. [20:57] <IT_Sean> did it Just Work, or did you have drivers to sort out? [20:59] <Ricksl> Btw anyone have a tutorial for reading hex tables? [20:59] <JakeSays> IT_Sean: i had to build the isight firmware tools to get the custom firmware to install on the camera, but after that it just worked. [21:04] <Ricksl> Glad to hear it just worked, I love it when things work after the first or second try. [21:05] <Ricksl> Best of luck. [21:05] <Ricksl> That sounds way over my experience level. [21:07] <JakeSays> Ricksl: you ever mess with PIR's? [21:10] <gordonDrogon> its relatively easy to connect a PIR to the Pi. [21:12] <Darkwell> do you need special cams for the cam slot or can you build whatever you like there for the slot ? [21:13] <JakeSays> Ricksl, gordonDrogon a few years ago i picked up one of these: http://www.halloweenforum.com/halloween-props/86777-radio-shack-talking-pumpkin-insert.html - i want to use the PIR off of it on my pi. [21:14] <Ricksl> Hm might be easy might not, depends on how the pir sensor fires off, some of them made for microcontrollers will just send a voltage when they detect movement. [21:16] <JakeSays> gordonDrogon: ah cool! [21:16] <gordonDrogon> most of the ones in alarm sensors, etc. need a period of stillness to 'reset', then any IR movement will trigger then. [21:17] <Ricksl> It looks like someone spliced the wire and found that it fires about a 3 volt signal when triggered. [21:17] <Darkwell> what kind of motion do wou want to detect ? [21:17] <Darkwell> motion of the device ( accelerometer ) or sens objects moving around from a distance ? [21:22] <wasutton3> does anyone know how to set up a raspi sd card so that it is usable both in windows AND as a bootable os? [21:25] <Darkwell> the machine with dinwos... is it already booted when you read the sd ? [21:26] <gordonDrogon> make the first partition bigger. [21:26] <wasutton3> iirc, the default bootloader points to the first partition (fat16), which then chainloads somehow into the main partition. [21:27] <Darkwell> what are you trying to do ? [21:27] <JakeSays> Ricksl: i'm seeing voltages from 2.3 to just under 5. [21:28] <Darkwell> wasutton3, and you cant conect the raspberry onto a lan and ftp/scp or whatever suits you files to your machine ? [21:29] <Darkwell> no bt dongle ? [21:31] <Darkwell> are you saying that you cant play music that way ? [21:32] <Darkwell> and not voltage drop ? [21:33] <Darkwell> does the pop sound predicable ? [21:39] <gildean> wasutton3: are you sure you can't mount it manually from disk manager? [21:43] <dagerik> i am able to play mp3 files fine with mplayer. but the sound on videos played with omxplayer is borked. i get different results on different videos. [21:52] <wasutton3> what happens when i run out of space...? [21:53] <Darkwell> ok what prob ? [21:53] <Encrypt> wasutton3, You've no more space on your SD Card ? [21:53] <dagerik> aplay, mpg123 and mplayer plays sound correctly. but omxplayer borks the sound. how do i diagnose this? [21:54] <ParkerR> dagerik, What sound are you trying to play? [21:55] <dagerik> ParkerR: it is a video i downloaded which has sound. yes i am using omxplayer -o local swap.avi. [21:56] <wasutton3> Darkwell, not easily. I could have it just start deleting the oldest ones, but what if the user wanted to keep them? [21:57] <MooseV2> Why don't you just have it sync from the usb? [21:59] <MooseV2> Wait, rsync can sync local? [22:04] <wasutton3> i dont quite follow. the file just asks the user if he wants to copy music to the drive? [22:06] <MooseV2> Why don't you just use usbmount? [22:20] <IT_Sean> oal you do know the raspi does not need heatsinks, right? [22:20] <Encrypt> How cold is your Pi then? [22:22] <Encrypt> Even without overclocking as far as I'm concerned! [22:25] <Darkwell> r is cupper to get at your place ? [22:25] <IT_Sean> You can always enable it later. [22:26] <Encrypt> On Rasbian ? [22:28] <IT_Sean> harris: it is generally A Bad Idea to post your password in here, for everyone to see. [22:28] <Encrypt> Just find "inet adr"
[22:34] <Darkwell> are you running raspbian ? [22:35] <Darkwell> but how did you change it in first place ? [22:36] <Darkwell> ok so so the apt-get command maybe rerwote the config(s) ? [22:44] <Encrypt> What's the aim then? [22:45] <Darkwell> you mean harris's prob or the heatsinks ? [22:46] <IT_Sean> the only point of selling heatsinks for the raspi is to alleviate some fools of their money..
[22:46] <IT_Sean> No, not maybe. [22:47] <IT_Sean> The Raspi, under normal conditions, does not require additional cooling. [22:47] <Darkwell> thats what i think is the prob with the "buttons"
[22:48] <Darkwell> how did you do it ? [22:52] <Darkwell> dont care about the vnc at all ok ? [23:01] <Darkwell> which page ? [23:01] <MachinaeWolf> What's the highest psu for the oldest model B? [23:06] <ladoga> ifconfig | grep "inet addr"
[23:12] <Peemo> Hey I want to add a "power switch" to my Pi, can anyone point me in the right direction? [23:12] <Peemo> I found this http://lifehacker.com/5994036/add-a-reset-switch-to-a-raspberry-pi which seems really easy but it's for a reset switch not a power switch. [23:13] <Darkwell> Peemo, no shutdown -h now ? [23:13] <ladoga> followed by "ssh -Y user@raspi"
[23:14] <Peemo> Darkwell: Oh of course I use that right now, but I'm making a gaming console and I would love a real power button to turn it on and off. [23:14] <Darkwell> Peemo, perhaps write a python script ansuse gpio ? [23:15] <Darkwell> and ues gpio ? [23:16] <ozzzy> does sshd compress the data by default? [23:18] <dagerik> i am able to play sound using mpg123, mplayer and aplay. however using omxplayer the sound gets distorted or different results on difference videos. i am using omxplayer -o local file.avi via ssh. video is good. [23:23] <dagerik> so omxplayer plays a mp3 or wav file nicely. but when playing videos, the sound is distorted. [23:44] <dagerik> the symptoms that is. [23:46] <pksato> dagerik: on all videos? any format? any codec? [23:46] <dagerik> pksato: all three i've tried. [23:48] <dagerik> omxplayer plays .mp3 and .wav files fine though. 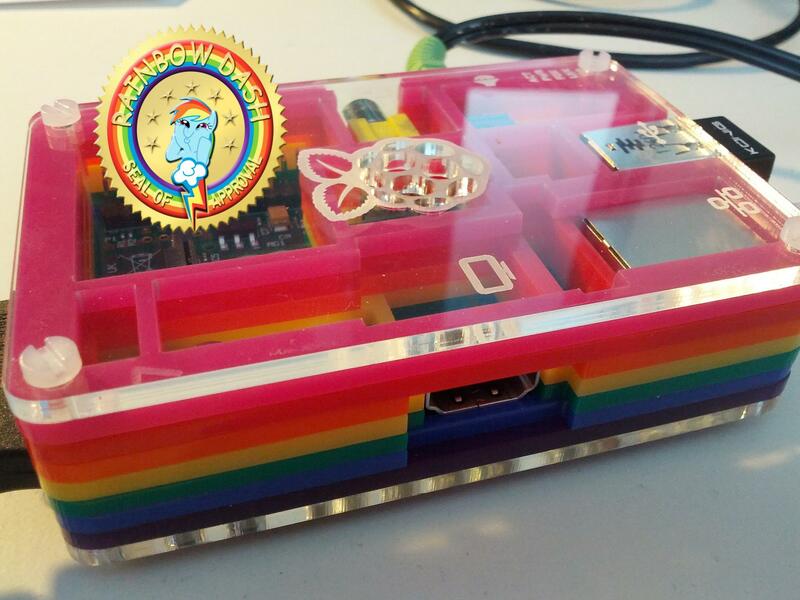 [23:48] <ant_thomas> did you download the raspian image labelled 2013-02-09? [23:49] <ant_thomas> have you tried to do any updates?